Bound in human flesh and inked in blood, the ancient "Necronomicon", (the Book of the Dead) unleashes unspeakable evil upon mankind in director Sam Raimi’s (Darkman, Drag Me to Hell) outrageously hilarious third chapter in his Evil Dead Trilogy. 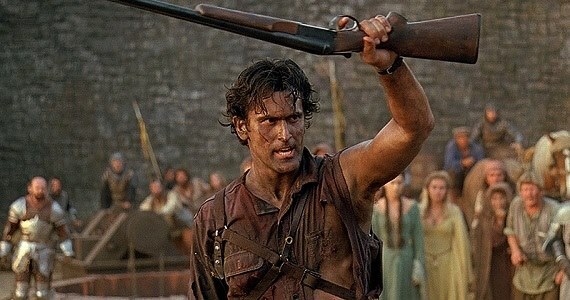 Back to do battle with the hideous "Deadites, ", Bruce Campbell returns to the role of Ash, the handsome, shotgun-toting, chainsaw-armed department store clerk from S-Mart’s housewares division. Demonic forces time warp him, and his Oldsmobile, into England’s Dark Ages, where he romances a beauty (Embeth Davidtz, The Amazing Spider-Man) and faces legions of the undead. Can Ash save the living from the evil dead, rescue his girlfriend, and get back to his own time?